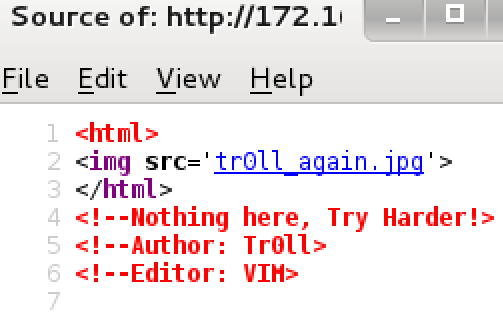 ← Tr0ll: 1 Walkthrough – TROLL, IN THE OS! 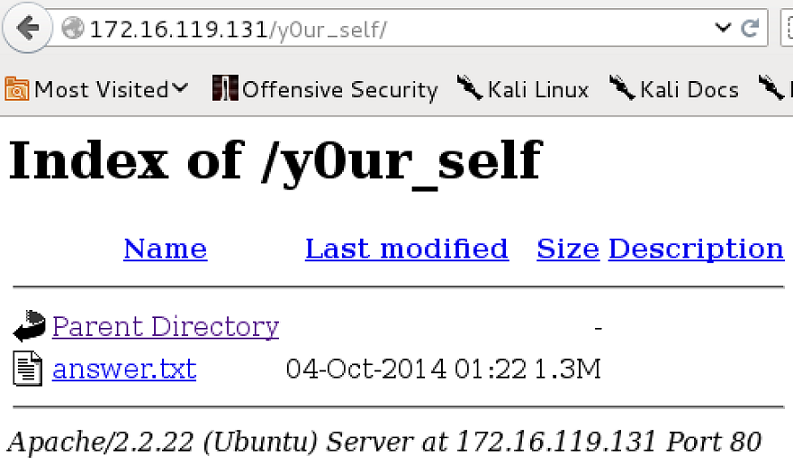 After all of the fun I had last time, why would I not do a walkthrough for Maleus's Tr0ll v2, also hosted on VulnHub? 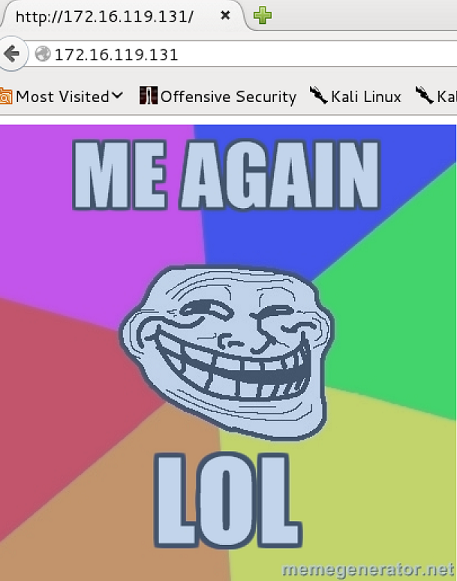 As usual, I first ran netdiscover to find the new troll. 172.16.119.1    00:50:56:c0:00:01    01    060   VMWare, Inc.
172.16.119.131  00:0c:29:f7:66:43    01    060   VMware, Inc.
172.16.119.254  00:50:56:ed:08:f7    02    120   VMWare, Inc.
With the IP in hand, it was time to fire up Nmap. Contrary to the joys of Tr0ll 1, I figured HTTP would still be my best bet for ingress. Of course I was greeted by an old friend, but I was more than prepared for him this time. Once again, I fired up Dirbuster to see if there was any low hanging fruit. Unfortunately, all roads led nowhere, so I figured I'd head back to the home page and check out the source. After some contemplation, I figured I'd try SSHing into the box as Tr0ll/Tr0ll. Of course, that "eh, what the hell?" attempt worked, but immediately got dropped. With HTTP getting me no where, I decided to start taking a look around the FTP side of things. Inside of lmao.zip was some sort of password protected file called "noob", but I had no idea what the password was at this time. Thinking this was another dead end, I decided to backtrack and check out the robots.txt to see if there was anything interesting there. With a big new list of directories, it was time to fire up DirBuster again and see what actually existed. 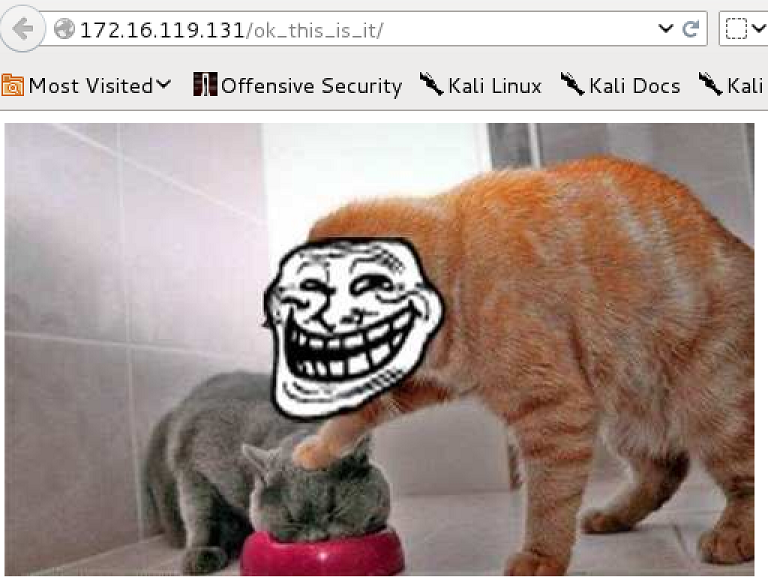 I checked out all of the directories that existed, but they all had the same trolling cat. Hoping that the file name was a hint, I decided to check the end of the bigger file to see if there was any useful and/or hidden information inside of it. At this point, I was already pretty familiar with this challenge's games, so I went back into the browser to check out the y0ur_self directory. Of course answer.txt didn't exactly have the answer I was looking for, but it was a start. Of course, it wasn't quite that easy since this wasn't another web directory, but once I tried that as the password for the lmao.zip file, it opened up and I was able to view the noob file. With this key I tried to SSH into the box as the noob user, but I received a very friendly message and a disconnect. I figured this had to be some sort of script or forced command being run, so I ran SSH in verbose mode and found the culprit (emphasis added to the line in question). After a bit of research and testing, I discovered that this forced command may be vulnerable to ShellShock, so I decided to give it a try. Well, with that working, I used it to spawn a shell, and add my public key to authorized_keys for noob to have a slightly more interactive terminal. With a local account obtained, it was time to escalate privileges. First I checked to see if anything useful was setuid 0, and I found three "doors" that could be chosen. It looked like, that while the actual doors rotate from time to time, they always had one of three functions. Connection to 172.16.119.131 closed by remote host. So, it looked like the user input door was my best bet (and was also the largest file, so wasn't hard to find when the doors ended up rotating). With that in mind, I threw 1,000 instances of "A" into it and received a wonderful segfault. Now that I was in more familiar, and less trolling territory, I fired up pattern_create, threw my new pattern at the input door, and found my EIP offset. Once I had the offset in hand, I decided to run one more test to make sure that I was overwriting EIP with the correct values. With all of this information, I threw together a quick test to obtain the address of esp for jumping into my shellcode. The reason for running this inside of env and un-setting the environment variables was so that I wouldn't get an incorrect memory address for esp. For more information on this, see the following StackOverflow answer. Since we don't need to worry about finding a JMP ESP in the binary, we can overwrite EIP with the address pointing to ESP. 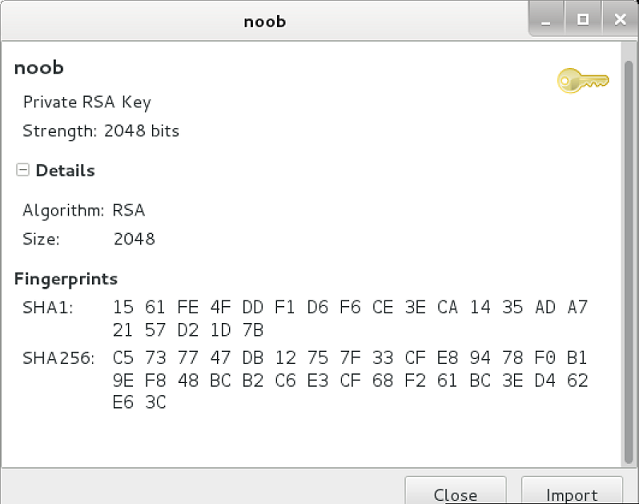 In this case, the following becomes our new EIP ("\x80\xfc\xff\xbf"). With my memory addresses and shellcode in hand, it was time to write my full exploit. And that was all she wrote folks. Just like last time, I dumped the shadow file as well in case someone was looking for some passwords to crack. Another enjoyable VM from Maleus, and with some exploit development this time as well. Tune in next time for a write up with hopefully a little less trolling. How did you find the jmp esp address for the shell code? I’m editing the post a bit now to make it more clear, but I’m jumping directly to ESP. For example, I’m not using an existing JMP ESP in the binary, but rather overwriting ESP with the actual address of ESP. So you are assuming that on every crash the esp address remains the same? Yes, in this case since ASLR is disabled we can assume that the address of ESP will remain the same (at least between reboots). That said, if this weren’t the case, you are correct in that we would need to locate a JMP ESP. Additionally, due to the way the program was compiled and the way the system is setup, ESP has a static address. That said, be on the lookout for more ways to exploit this binary soon!